High tea at the Peninsula Hotel is a Hong Kong institution, but after seeing the grumpy faces in the long, long queue we decided to head over the road to the Intercontinental Hotel and see what they had to offer. 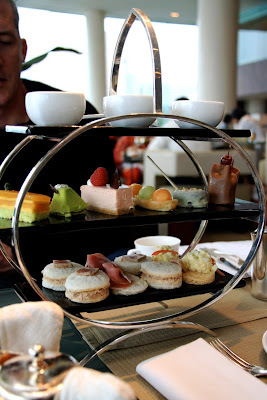 What a pleasant surprise it was - no queues, fabulous Hong Kong harbour views from floor-to-ceiling windows, and high tea in an art-deco inspired server with a choice of coffee or Mariage Freres teas. Delights such as rose scented raspberry cheesecake, green tea delice, scones with earl grey jelly and clotted cream, and miniature individual balck forest gateaux had me in high tea heaven. And guess what? You pay a lot more at the Peninsula to stand in a queue for an hour then sit in a dark lobby with no view.